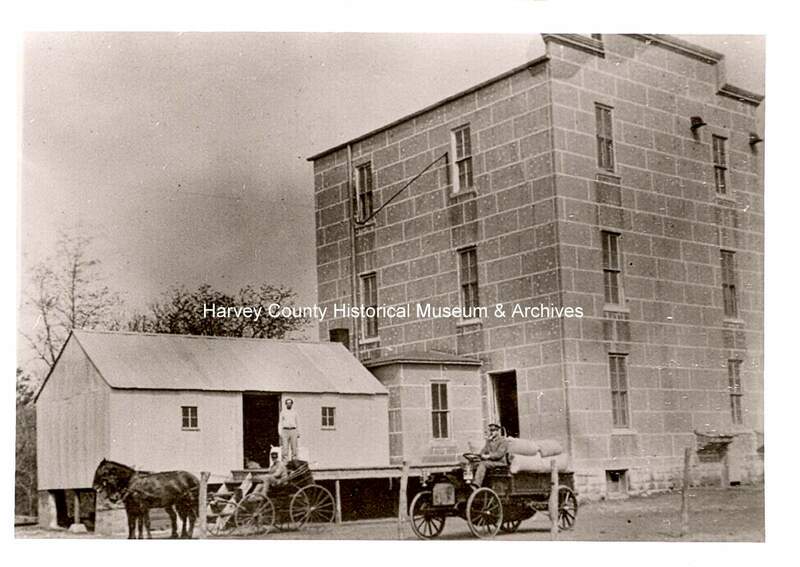 Alta Mill in Northwest Rural Harvey County. Operation dates: 1876 to 1949. Since it was both a commercial enterprise and a community gathering center, Alta Mill was unique in Kansas. It was one of a very few mills which made the transition from water power to engine power and from burr mill (stone grinding) to roller mill technology. Surviving deep into the 20th century, it was a family, person-to-person business. Alta Mill was in the country and was not on a railroad. Its draw was from at least four communities and ethnic groups: the Moundridge Swiss Volhynians, the Buhler Low Germans, the Halstead South Germans and the Burrton Euro-Americans (called “Englishers”). As example of an American “melting pot,” the Mill had customers who did not speak the same language, and even though many were Mennonite Christians, there was some suspicion between the ethnic groups. In spite of that, they mixed and mingled. Added to the blend were people from Newton, McPherson and Hutchinson. Customers came from as far away as Meade, KS and even Oklahoma. Alta Mill was a destination place—an early days vacation site. A farm couple would load a wagon with wheat, put the kids on top and take a trip to Alta Mill. They would do business at the mill then go to the park, maybe camp for a couple of days, fish, swim, boat, play games in the park, eat with the Stucky families, and return home. In addition to the mill, there was a park, a store, a garage and service shop for REO cars, a blacksmith shop and a Rumely tractor and combine dealership. At times, there was a post office. Prominent figures in the operation of the mill were Peter M. Claassen, John E. Stucky and Jacob B. Stucky. Photo Source: HCHM collection.